Transcript: NPR's Interview With Bernie Sanders Vermont Sen. Bernie Sanders speaks to Morning Edition host Steve Inskeep about whether he will work for party unity if he does not win the Democratic nomination. Sen. Bernie Sanders pauses during a campaign event in Louisville, Ky., on Tuesday. Democratic presidential candidate Bernie Sanders spoke with NPR's Steve Inskeep. STEVE INSKEEP: How is West Virginia different, if at all, from anywhere else you campaigned? SEN. BERNIE SANDERS: Well, West Virginia has some pockets of the worst poverty in the United States of America. We're going to McDowell County. And the reason we're going there is that about half the people in that area are living in poverty — and that what is really astounding is that the life expectancy of people in that community is extraordinary low. You know when we talk about poverty, Steve, we often think, well, it's too bad somebody can't afford a flat-screen TV, or go out to eat. But what poverty is really about is that we have millions of people who are living — who are dying at ages much, much younger than they should. In McDowell County, where we're going tomorrow, the average life expectancy for men in that county is 64 years of age. Sixty-four years of age. SANDERS: ... I think it's even higher than that actually. INSKEEP: ... a lot of people are certainly close to that. But there's another statistic that's on my mind, along with the poverty stats, and the life expectancy — shocking life-expectancy stats. You're going to a couple of counties — McDowell County, W.Va., is one of them — that voted for Barack Obama in 2008, and then voted against him, for Mitt Romney, in 2012. What has been happening to the Democratic Party in the region where you're going? SANDERS: Well, that's an excellent question, and I think it goes well beyond McDowell County and well beyond West Virginia. And I think there are many people around this country — poor people, working people — who believe that the Democratic Party is not effectively standing up to them. Now, if I lived in McDowell County and the unemployment rate was sky-high, and I saw my kid get addicted to opiates and go to jail, there were no jobs, you know what? I would be looking at Washington and saying "what are you guys doing for me?" And I'm going to look for an alternative. I think one of the challenges we face, what my campaign is about, is making it clear that the Democratic Party must be on the side of working people and low-income people. Now I'm talking about poverty, and in this campaign I'm talking about the fact that we have the highest rate childhood poverty of almost any major country on Earth. That we have 47 million people living in poverty ... that we have 29 million people who have no health insurance, and we have thousands of people who die every year because they don't get to a doctor on time. The Democratic Party must make a stand, and the stand is that you cannot be on the side of Wall Street. You cannot be on the side of that pharmaceutical industry — which, by the way, charges our people the highest prices in the world for prescription drugs — you gotta make a stand. And the stand we gotta make is the stand with the people in McDowell County, W.Va., and poor people and working people all over this country. INSKEEP: ... of people in Appalachia who are concerned about that history? SANDERS: Look, I have spent my whole life fighting for working people. I have a 98 percent voting record with the AFL-CIO. I have opposed disastrous trade agreements — and I think there is perhaps no candidate in the United States Senate who has a more progressive record than I do. But I also believe, and understand, as a member of the Senate Environmental Committee, that climate change is real, it is caused by human activity, and it is already causing severe problems in our country and around the world. And we have to transform our energy system away from fossil fuel to energy efficiency and sustainable energy. Now, I have introduced the most comprehensive climate change legislation ever introduced in the U.S. Senate. And in that legislation — because we understand it is not the fault of the coal miners, or people included in the fossil fuel industry, they have a right to want to feed their families, and live in dignity — we have $41 billion in that legislation to make sure that those workers who might be displaced as a result of the transition away from fossil fuel get the extended unemployment benefits they need, get the education they need, get the job training that they need. And also we are going to invest heavily in those communities. INSKEEP: How do you speak to people in a community like that, who have deeply mixed feelings about government? You may run into the same person who says "I'm on Medicaid, I get various kinds of assistance, but I really don't like it. I don't like living like this, I don't like depending on government." SANDERS: Well, I think it raises a fundamental issue about politics in America today and who we are as a civilized society. I understand that the right-wing has done a very good job in suggesting that "freedom" — and this is the Koch brothers' line — "freedom" is about ending social security ,and Medicare and Medicaid, and actually abolishing the concept on the minimum wage. So Steve, you can be a free guy and work for $4 an hour — aren't you a lucky guy? But you know what, most Americans don't believe that, and one of the things I'm really proud of in this campaign is that in election after election — in primary and caucus after caucus, right here in Indiana where we won last night two-thirds of the people 45 years of age or younger. ... And the reason I think is they understand that in a democratic, civilized society, government has a very important role to play. And the word has gotta get out — it doesn't get out all that often in the media — that the United States is the only major country on Earth, for example, that doesn't guarantee health care for all people. Life would be a lot different in McDowell County if all of the people there, and all of the people in Vermont, and all of the people in Connecticut, had health care as a right, which is the case 50 miles north of where I live, in Canada, for example. INSKEEP: What do you say then, to people who just say — "regardless of my own situation, it bothers me that government has to do so much for people, or is doing so much"? I think what you have seen in the last many years in this country is a very coordinated effort of the part of corporate media, and the wealthiest people in this country, to perpetuate an ideology, which says that government is terrible, government is awful — oh by the way, except when we can get some corporate welfare. I point out in all of my speeches, Steve, that Walmart — which is owned by the Walton family, the wealthiest family in this country, worth some $149 billion — they get a huge subsidy from the taxpayers of this country, from you, from me, from every working people, person, because the wages they pay their employees are so low that many of those workers have to go on Medicaid or food stamps in order to survive. I don't think the middle class of this country should be subsidizing the wealthiest family in the United States of America. So I guess if it's OK for the Walton family to get billions of dollars of support from the taxpayers of this country, maybe its OK for working families to get health care and paid family medical leave. INSKEEP: Senator, I put a call out on Twitter — I said "I'm talking to Bernie Sanders, you got anything you want to know" — and the most consistent theme in the many responses we got had to do with how long you're going to stay in this race. Even though you just won Indiana, people are looking at the delegate counts, recognizing that you've got long odds, and wondering if you're going to stay in too long. SANDERS: Well we're going to stay in till the last vote is counted, and that will be in the primary in Washington, D.C.
BS: That's right. We think that ... I don't know, maybe I'm old-fashioned, but I think that the people of every state in this country — including the largest state in America, California — should have a right to cast their votes as to who they want to see as president of the United States, and what kind of agenda they want the Democratic Party to have. We won last night in Indiana — that is our 18th state. We're going to fight in West Virginia — I think we've got a shot to win there. We've got a good shot to win in Oregon, and I think we've got a good shot to win in California and some other states, so we are in this race till the last vote is cast. INSKEEP: Let me ask a couple of specific questions — just people on Twitter — here's one. Are you threatening your revolution by continuing, and alienating some Democrats from voting for Hillary Clinton eventually? SANDERS: Well I think we are perpetuating the political revolution by significantly increasing the level of political activity that we're seeing in this country. Millions of people are now coming into the political process as the result of what our campaign is about. I think it is good for the Unites States of America, good for the Democratic Party, to have a vigorous debate, to engage people in the political process. You know, two years ago in 2014, 63 percent of the American people didn't even bother to vote, and 80 percent of young people and 80 percent low-income people didn't bother to vote in the midterm elections — I think that that is pretty pathetic. And I think that Democrats do well when the voter turnout is high. Republicans lose when the voter turnout is high.So I'm going to do everything I can to stimulate political discourse in this country — get young people, working people involved in the political process. We think we have a path towards victory — admittedly it is a narrow path, but when I started this campaign we were 60 points behind Secretary Clinton; yesterday here in early May we won in Indiana. I think we've got some more good victories coming — so we are in this race until the very last vote is cast. INSKEEP: Another variation on this question from Twitter: Which is more important, a Sanders presidency or a Democratic presidency? SANDERS: Well, I think that if you look at the issues facing this country, and the differences between Secretary Clinton and myself, I think, a) my policies and my agenda will be better for the working families of this country, and second of all, if you look at virtually every poll that's out there — including one from CNN today — Bernie Sanders does better against Donald Trump than does Hillary Clinton. So if we want to make sure that we do not have a Donald Trump in the White House, I think that at this point Bernie Sanders is the strongest candidate. INSKEEP: Do you mean a Sanders presidency is more important than this person's suggestion that a Democratic presidency might be more important? SANDERS: Well, what I'm just suggesting is — if you look at every poll that's out there — Bernie Sanders does better against Donald Trump, more likely to defeat Donald Trump, than Hillary Clinton. INSKEEP: One more question along those lines, and this is my question now — you told Chuck Todd of NBC the other day that if Secretary Clinton does clinch the nomination quote "the responsibility will be on Secretary Clinton, to convince all people," not just your supporters, "that she is the kind of president this country needs." Are you convinced, Senator? SANDERS: Well I thought my point was, that it's true of Secretary Clinton, it's true of Bernie Sanders, it is true of Donald Trump — you want to go out and win elections, you've got to convince the people of this country that you are the candidate that works best for their interests. And I think there's a lot of work that has to be done on the part of all of the candidates. INSKEEP: The reason I ask is because you did say earlier in the campaign she was not qualified. Can you convince yourself, or have you convinced yourself, that she is qualified? SANDERS: Right now — as I have said many times, Steve — I think that a Donald Trump presidency would be a disaster for this country. And I intend to do everything that I can to see that that does not happen. INSKEEP: Does that mean to say that you would be out this fall if you don't win the nomination, campaigning? SANDERS: You know, as I just said Steve, I think that a Donald Trump presidency would be a disaster for this country. INSKEEP: Senator? Do you mind if I ask one more question? SANDERS: One last question. Sure, we got time for one more. INSKEEP: Yeah just, talk me through — because you said you have tough path, but one that you can walk — I'm just interested about a little bit of the mechanics here. SANDERS: Yes, it's an uphill battle. But you know what? Steve, when I started this campaign, it was an extraordinarily uphill battle — we were 60 points behind Secretary Clinton. Polls out there in the last few weeks, a few had us ahead actually in national polls, or a few points behind. The path to victory is to do extremely well in the remaining states — and as you indicate, California, of course, is the largest state. And we hope to do well there, and win that state. The problem, one of the main problems that we have, is that the establishment Democrats, of course, supporting all of — virtually all of them are supporting Hillary Clinton. I think that in those states where we have won landslide victories, those delegates should reflect the wishes of the people of their state and give us their votes. And then I think we have got to make the case to the superdelegates, who in many cases, were on board for Hillary Clinton even before I got into the race, that they should take a hard look at which candidate is stronger against Donald Trump. And I think we can make that case. SANDERS: Steve I apologize — one more question, because I've gotta run here. INSKEEP: Is there a real danger that Donald Trump — now that he's the presumptive Republican nominee — that he's the kind of different candidate who might seriously appeal to the very kinds of voters that you've been appealing to all this time, that you want to bring back to the Democratic Party? INSKEEP: A real danger of that, yeah, in the fall? 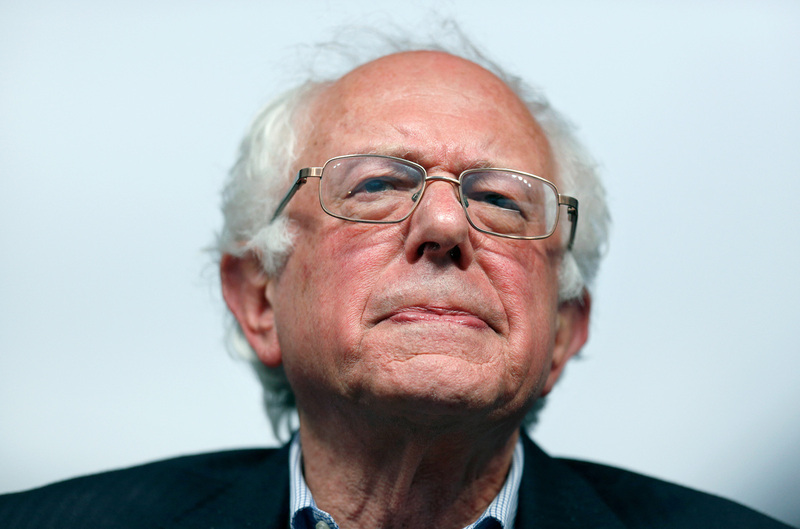 SANDERS: You say a risk? Well, you know as I said a moment ago — what campaigns are about is going out and making a case to the American people. Does Donald Trump have support in this country? Of course he has support — he has won the Republican nomination, so of course he has a lot of support. He has won it overwhelmingly in state after state after state. INSKEEP: Can he drag Democrats over to the Republican side? SANDERS: Well the question, I think that's the wrong question, Steve. The question is, why is somebody with Donald Trump's perspective appealing to Democrats? That gets back to the question we talked about at the beginning of this conversation. Has the Democratic Party, has the leadership made the case that they are standing there, fighting for the poor people of McDowell County, or the working people of Indiana, or of New Mexico, or of California? Have they stood up and said that "maybe we gotta take on the billionaire class, maybe it's wrong that the top one-tenth of 1 percent now owns almost as much wealth as the bottom 90 percent, maybe we should not be getting significant sums of money from Wall Street or from the pharmaceutical industry that charge us the highest prices in the world for prescription drugs," you know, "maybe we've gotta stand with the people who for the last 20 or 30 years have seen a decline in their standard of living"? You know, those are the issues that the Democratic Party has got to ask itself. And I think when it does, and it makes it clear that they are prepared to take on the big-money interests, I think the Democratic Party will do just fine — and that's kind of what this campaign is about. SANDERS: Thank you very much Steve. Take care.